Jennifer Black Reinhardt grew up in a cozy town in the mountains of Pennsylvania, surrounded by creative artists and quirky collections. Drawing from that inspiration, Jennifer graduated from Carnegie Mellon University where she received a degree in Illustration. After working at advertising agencies and honing her skills at now obsolete design technology, Jennifer went on to have her artwork featured as best selling calendars, humor books, needlepoint kits, collector plates, and a Louie Award winning line of greeting cards. 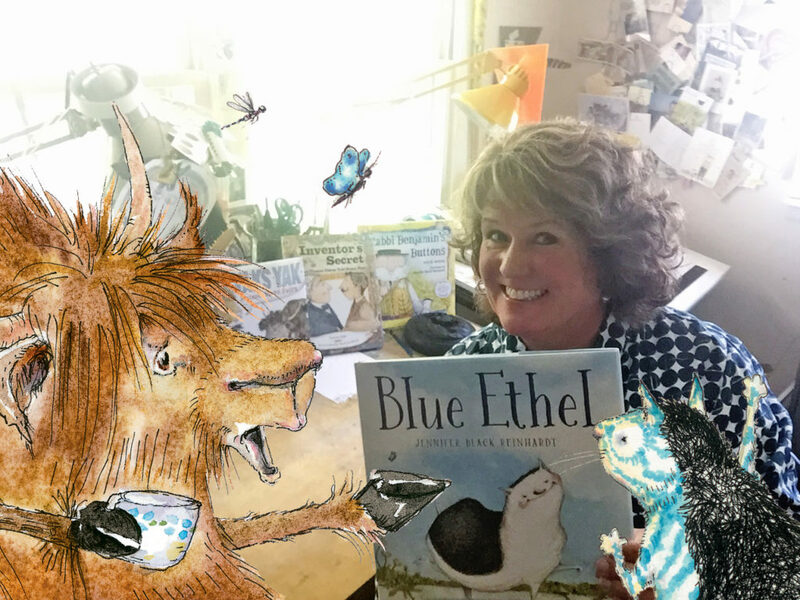 Jennifer is the illustrator of several books for children including; Gondra’s Treasure, written by Newbery award winning author Linda Sue Park (Clarion Books, Houghton Mifflin Harcourt, April, 2019), Sometimes You Fly, written by Newberry award winning author, Katherine Applegate (Clarion Books, Houghton Mifflin Harcourt), Blue Ethel, written and illustrated by Jennifer Black Reinhardt and published by Margaret Ferguson Books, Yaks Yak (Clarion Books, Houghton Mifflin Harcourt) written by Linda Sue Park, The Inventor’s Secret; What Thomas Edison Told Henry Ford (Charlesbridge Publishing) by Suzanne Slade, Rabbi Benjamin’s Buttons (Charlesbridge Publishing), by Alice B. McGinty, and The Adventures of a South Pole Pig (Harcourt Children’s Books, Houghton Mifflin Harcourt), written by Chris Kurtz. What’s next? Watch for Playing Possum, written and illustrated by Jennifer (Clarion Books, Houghton Mifflin Harcourt, 2020). Trading the mountains for the prairie, Jennifer now lives in Iowa City, Iowa. She happily works in a comfortably messy studio in her home where she lives with her family. ©2017 Jennifer Black Reinhardt Illustration. All Rights Reserved.